Man first walked on the Moon 45 years ago today on July 20, 1969 when American astronauts Neil Armstrong and Buzz Aldrin opened the hatch to the Apollo 11 Lunar Module Eagle, climbed down the ladder and set foot on the surface – marking mankind’s greatest achievement. They came in peace for all mankind! 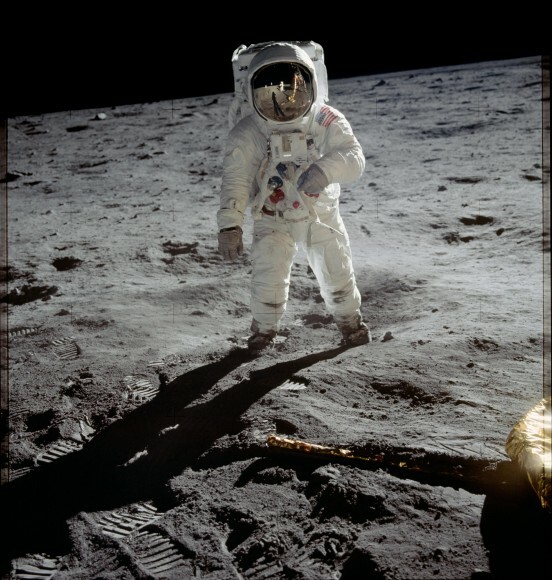 You can relive the historic moment with the gallery of Apollo 11 NASA images collected here and by watching NASA’s restored video of the moonwalk, or extravehicular activity (EVA) by Armstrong and Aldrin – watch video below. The Apollo 11 EVA began at 10:39:33 p.m. EDT. NASA TV is also broadcasting a replay of the historic moonwalk tonight (July 20) to commemorate the anniversary starting at 10:39 p.m. EDT, with the restored footage of Armstrong and Aldrin’s historic steps on the lunar surface. You can view the NASA TV Apollo 11 EVA webcast – here. The Eagle had landed on the Moon’s desolate surface on the Sea of Tranquility (see map below) barely 6 hours earlier at 4:18 p.m EDT. And only 30 seconds of fuel remained as Armstrong searched for a safe landing spot. Neil Armstrong was the commander of the three man crew of Apollo 11, which included fellow moonwalker Buzz Aldrin and Command module pilot Michael Collins. The trio blasted off atop a 363 foot-tall Saturn V rocket from Launch Complex 39A on their bold, quarter of a million mile moon mission from the Kennedy Space Center , Florida on July 16, 1969 to fulfill the lunar landing quest set by President John F. Kennedy early in the decade. The Apollo 11 mission was truly a global event. Armstrong and Aldrin safely touched down at the Sea of Tranquility on the lunar surface on July 20, 1969 at 4:18 p.m EDT as hundreds of millions across the globe watched in awe and united in purpose. Following the triumphant moonwalk and docking, the crew set their sights for the journey back to the Home Planet. The Apollo 11 mission ended with a successful splash down off Hawaii on July 24. The crew, NASA and America achieved President Kennedy’s challenge of men walking on the Moon before the decade was out and returning safely to Earth. Surviving crew members Aldrin and Collins will join NASA Administrator Charles Bolden at a ceremony on Monday at the Kennedy Space Center. Altogether a dozen Americans have walked on the Moon during NASA’s five additional Apollo lunar landing missions. No human has returned since the final crew of Apollo 17 departed the Moon’s surface in December 1972. One legacy of Apollo is the International Space Station (ISS) where six astronauts and cosmonauts work together on science research to benefit mankind. Notably, the Cygnus commercial cargo ship berthed at the ISS on the 45th anniversary of the Apollo 11 liftoff bringing over 3600 pounds of science experiments and supplies to the station. NASA’s next big human spaceflight goals are building commercial ‘space taxis’ to low Earth orbit in this decade, an asteroid retrieval mission in the 2020s and voyages to Mars in the 2030s using the new SLS rocket and Orion deep space crew capsule currently under development.